What’s black, white and red all over? No, not a penguin with a sunburn. Try again. It’s the red-cockaded woodpecker! (The red part is actually just a small stripe on its head). Sadly, though, these little guys are nearly extinct. But our Wild Earth Action Team (WEAT) is ensuring these birds keep pecking away for a long time. 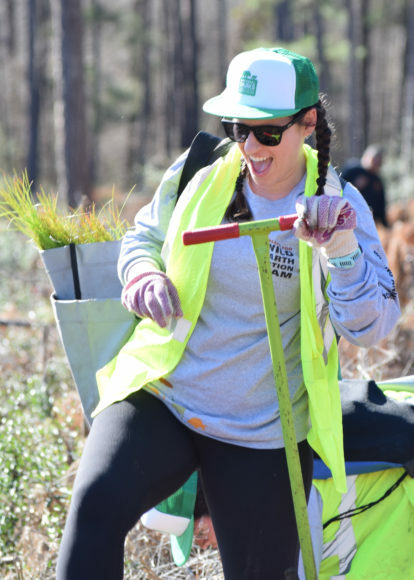 The team just wrapped their third annual trip to the Big Thicket National Preserve where they planted longleaf pines to help restore habitat for this endangered bird and other species. For the red-cockaded woodpeckers to survive, they need to be able to safely nest – and they rely on longleaf pine forests to do that. 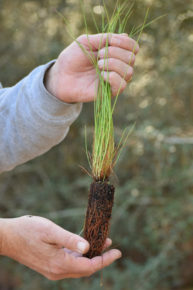 So we’ve gotten to work, and over the past few years, the Dallas Zoo and a team of volunteers have planted more than 30,000 longleaf pines to reforest 300 acres for habitat. We couldn’t make these expeditions happen without our rock star community joining us to protect Texas wildlife. We rely on people like you to help us reach our conservation goals. One of our most ambitious goals this year is to remove ten tons of litter pollution from wildlife habitats. Help us reach this by pledging to pick up just ten pieces of litter every Tuesday. It’s that simple! Learn about the Ten on Tuesday campaign here. You can also join us on one of our Wild Earth Action Team expeditions! We head to Corpus Christi March 2-4 to restore habitat for the endangered whooping crane, plus, we’re doing a ton of cool activities. Learn more about the trip! Coordinator of Animal Behavior Science Nancy Scott guest-blogs on ZooHoo! 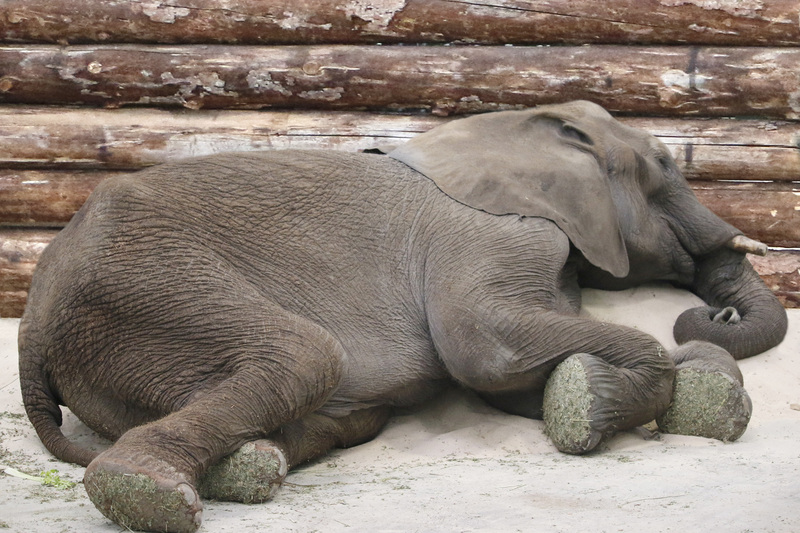 about a study conducted on our elephants’ sleep habits and behaviors. Sometimes we can’t sleep the night before Christmas or before a big test. Whether it’s something exciting or scary, big events can affect how well we sleep at night. The same goes for animals, too. When the Dallas Zoo rescued elephants from Swaziland last spring, we really wanted to confirm they felt comfortable enough in their new environment to sleep well at night. Our first step was to see how many hours our longtime residents, the “Golden Girls,” were sleeping at night, so we could compare the groups. The thing is, I like to sleep as much as the next person, so how were we going to keep track of elephants sleeping while we were sleeping, too? Technology to the rescue! We used video cameras in the elephant barns to record what the elephants did at night, and then reviewed the footage the next day… while we were awake. Although elephants can doze standing up – sometimes even while leaning against a rock or using their trunk as a fifth limb for balance – they’re most relaxed when lying on their sides. For this study, we wanted to know how much time the elephants were lying down and getting the very best sleep. Our observations of the Golden Girls told us Jenny likes to go to bed around 10-11 p.m., while the other three females are usually asleep by midnight. And just like you may have to get up in the middle of the night to use the bathroom or raid the fridge, the elephants don’t sleep through the night, either. They usually get up three or four times a night, sometimes changing sides, or location. “When Gypsy finally goes to sleep, Jenny will bug her until she wakes up … and then lay down in her spot! Gypsy doesn’t seem to mind. What a friendship!” research volunteer Jill Donaldson said. While volunteering as a Base Camp ambassador, Jill has seen the elephants using sand to dust themselves in the Savanna – especially after a good mud wallow – but she didn’t realize they also use the sand piles as a pillow. The keepers often see imprints of the elephants’ skin in the sand piles in the mornings. The elephants rescued from drought-stricken Swaziland seemed very comfortable their very first night in their new home at the Dallas Zoo, according to our observations from just about a year ago. There was plenty of sand for pillows, and they certainly took advantage of it. Feeling relaxed in their new home, the rescued adults slept just as long as our resident Golden Girls – about 3-4 hours per night. We quickly learned their personalities from the overnight video. Our bull, Tendaji, likes to sprawl out with his legs in front of him and will sometimes be on his side with his eyes still open, trying to eat hay while he’s lying down. Nolwazi tends to go face-first into the sand when she beds down. Research volunteer Julie Evans (who can also be found in the Gorilla Research Station or Base Camp when she’s not observing sleeping elephants) remembers a favorite moment when “Nolwazi raised her head to check that her daughter, Amahle, was sleeping peacefully, then Nolwazi put her head back down.” A typical youngster, Amahle sleeps longer than the adults, resting around 4-5 hours each night. Donaldson wasn’t sure if watching sleeping elephants would be interesting when she first signed up to help, “… but no way am I bored. They are all fascinating!” she said. 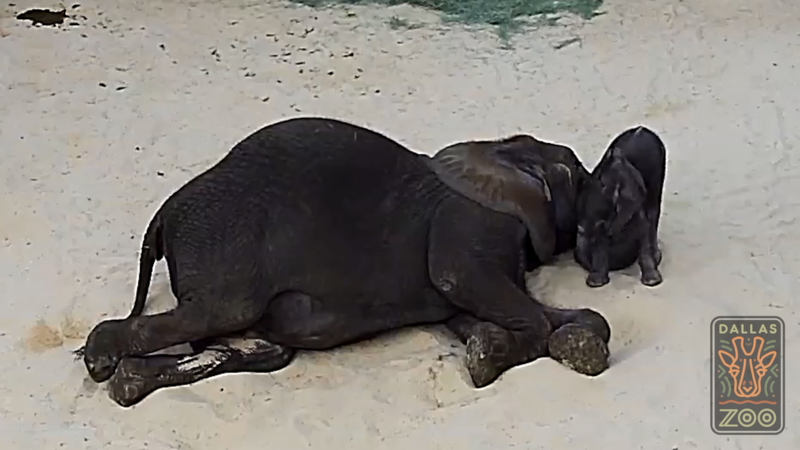 After calf Ajabu was born last May, we learned a lot about baby elephant sleep patterns, too. He loves to climb all over his mom just as she’s trying to get some much-needed shuteye for herself (sound familiar, parents?). “If all else fails, he’ll curl up under her chin and sleep a little longer,” said research volunteer and Base Camp ambassador Barbara van Pelt. Ajabu takes more than a dozen naps each night (for a total of 6-7 hours of rest) when he’s not pestering his mom, playing with Amahle, or practicing his balance skills on a log. While Jill and Barbara are impressed by his perseverance, Rhonda loves watching him for his tightrope skills. You may have seen him practicing in the habitat by climbing rocks. Our volunteers contributed an average of 20 hours a week over the past 14 months on this important project. 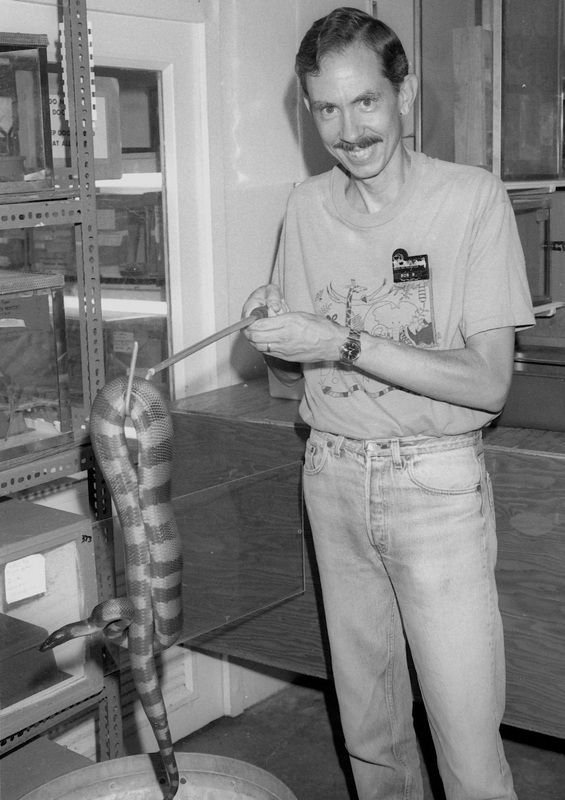 Long before the Dallas Zoo had an organized volunteer program, Bob Butsch spent his Saturdays helping take care of various animals in the Herpetarium where our reptiles reside. For free! As of today, he’s our longest serving Keeper’s Aide volunteer, having volunteered almost every Saturday for nearly 30 years. (Yes, three decades.) If you do the math, half a day for 50 Saturdays out of the year for 29.5 years totals 5,900 hours! That’s 245 days. Can you imagine having that under your “Volunteer” tab on your resume? Wow. Additionally, he’s been in the Herpetarium longer than anyone, including keepers and curators. Bob began as a volunteer at the Zoo on Memorial Day weekend in 1987. On a trip to the Zoo with his wife and then 2-year-old son, he wondered about putting his master’s degree in biology to work. He called the Zoo’s Education Department, who told him they had no openings for volunteer docents (who answer guests’ questions). They directed him to the reptile department, who took him in. He’s had a weekday job for even longer, where he does IT programming for a medical company. But he graduated with his bachelor’s in Biology and Chemistry at the University of Texas-Arlington, then went on to complete his master’s in Biology at the University of North Texas. Volunteering at the Zoo, for him, is a way to exercise his knowledge in a meaningful way. In 1987, he started out answering guests’ questions as a docent. After his first few months, a reptile keeper took him behind the scenes to give him an impromptu “evaluation.” This simply involved seeing how well he could handle the animals. After he handled a snake with no fear, he became a Keeper’s Aide Volunteer. In July 1991, Bob Butsch was recognized at Dallas Zoo’s volunteer of the month. 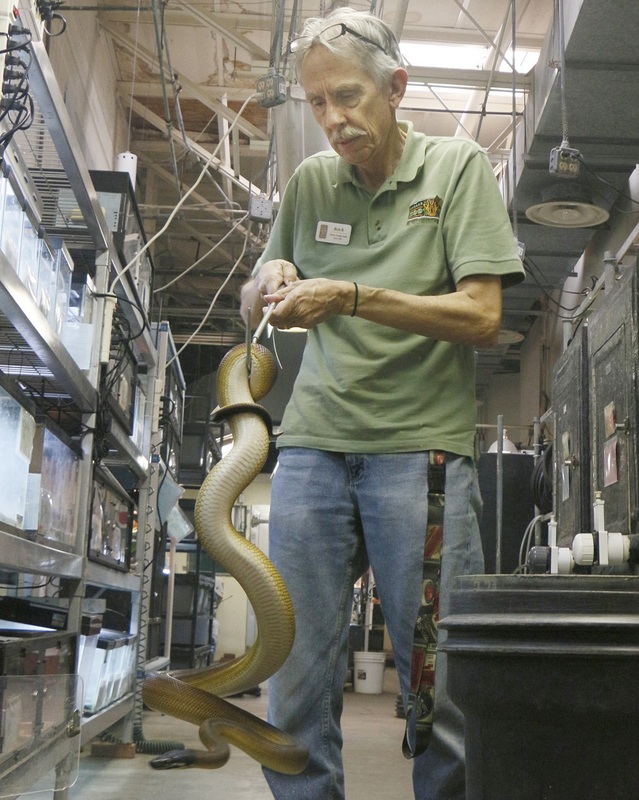 Ever since, he’s worked with various animals in the Herpetarium, including amphibians and reptiles of all kinds. He’s done every job available to volunteers for this department. While he has helped in several different ways, he still must follow the rules specific to volunteers, despite his long career of volunteering. Yet he’s been around on Saturdays for so long that nobody has to watch over his shoulder as he goes about his work. “It’s really flattering when I come in,” he said. “They hardly bat an eye.” That’s the ultimate sign of trust that he’ll do the job right. He’s seen many changes at the Zoo over the years, like the fact that the Herpetarium used to be an aviary, with birds and reptiles coexisting in the same building. He’s also lived through the replacement of the entire AC unit, taking care of animals out in the lobby so they were out of the way for the workers. And construction, lots of construction, as the Zoo remodeled and improved exhibits. As for us at the Zoo, we love having such a dedicated and happy volunteer helping us build a better world for animals. For information on how you can volunteer at the Zoo, check out our Volunteer page. Kohl’s, one of our most dedicated groups, works hard to clear bamboo out of our tiger habitat. We’re grateful that Kohl’s has donated funds to our volunteer programs, and frequently spends time improving our Zoo. It’s time to get our hands dirty and clean up! 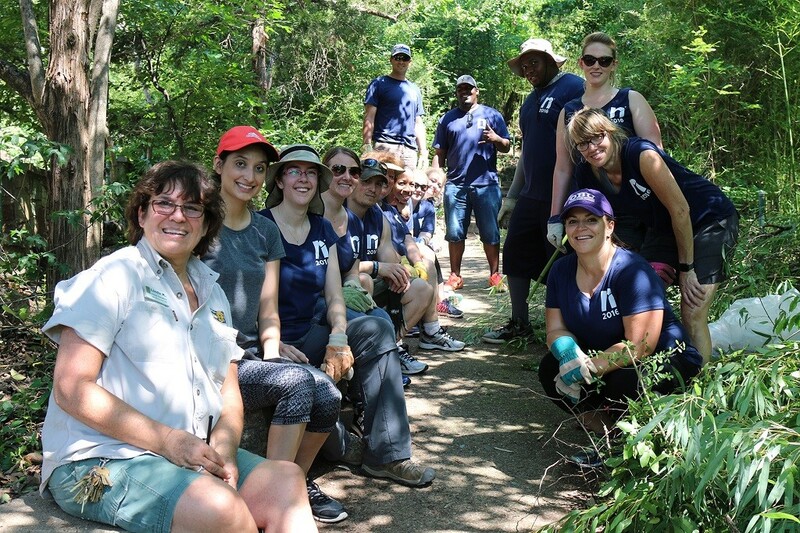 Today we hosted our second-ever Corporate Workday event with more than 130 volunteers. Our staff worked alongside these selfless professionals on multiple projects throughout our 106-acre park. Our friends from Kohl’s, Fossil Group, Humana, HP-E, Kimberly-Clark Corporation, Samsung, and American Airlines helped us get the Zoo squeaky clean. A few jobs they worked on today included: raking up leaves in the tiger habitat; spreading mulch in behind-the-scenes animal yards; gardening; and scrubbing down our animal hospital. Our Corporate Workdays benefit everyone involved. Companies get a chance to give back to their community and spend valuable team-building time together, and we get much-needed help with some of our projects. As a non-profit, days like this are vital to making our Zoo the best it can be. You don’t have to be part of a corporate team to volunteer, though! Check out all the ways you can help the Zoo and give back to your community. 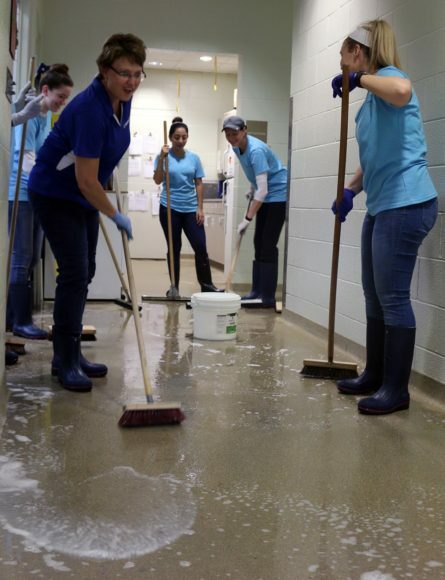 Kimberly-Clark Corporation volunteers clean the floors of our animal hospital. Volunteers from American Airlines work on winter window coverings for our gorilla building. Mammal Supervisor Linda King (far left) poses with volunteers from Research Now. That’s a wrap! 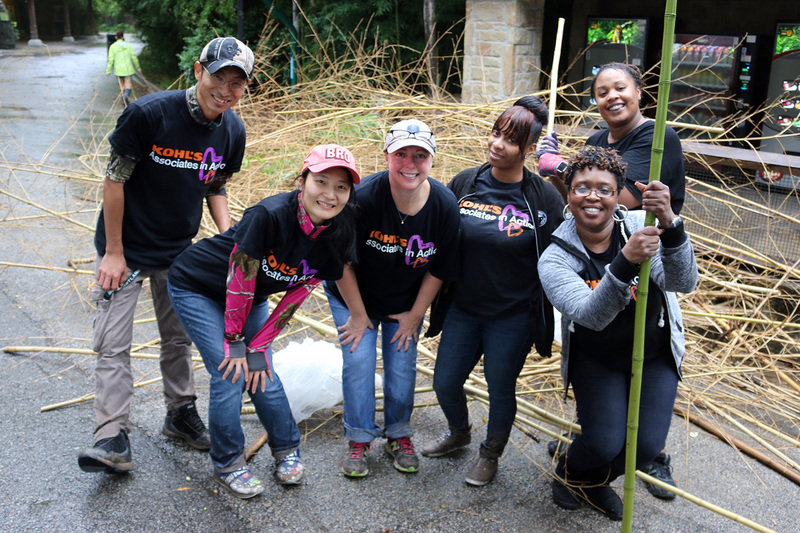 We are thrilled to announce the success of our first-ever Corporate Workday event. 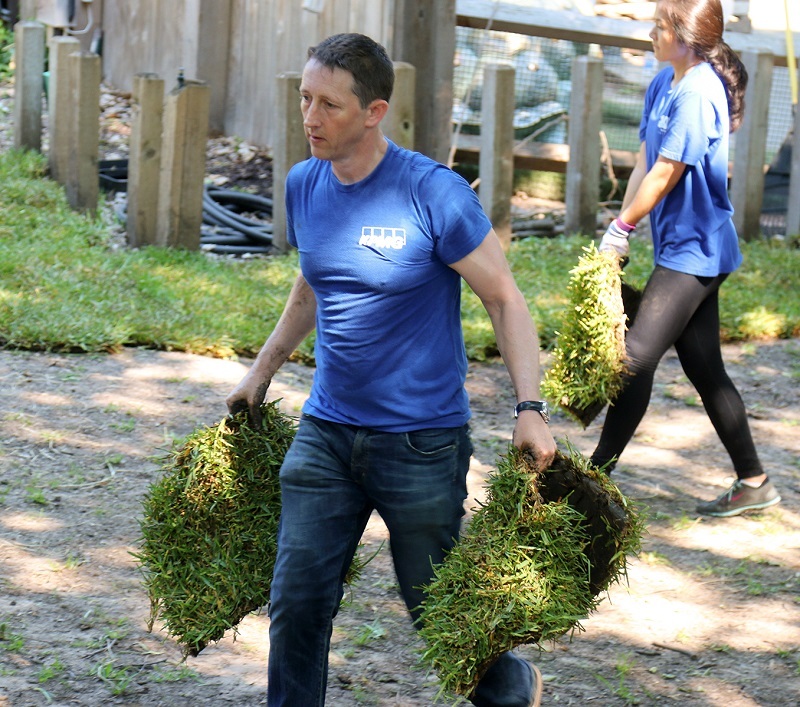 More than 150 volunteers from KPMG, Kohl’s, Research Now, Holmes Murphy, Deloitte & Touche, and HP-E dedicated their time to improve our Zoo. 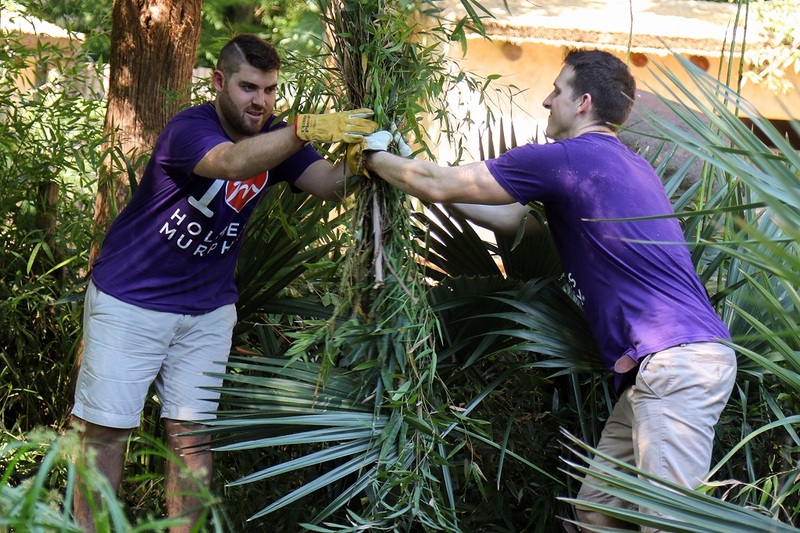 Our corporate volunteers tackled projects like adding new sod to the tortoise exhibit; building bamboo fences; landscaping primate and carnivore habitats; giving our buildings a fresh coat of paint and more. Why would corporate professionals want to come in early, break a sweat, and get dirty on a Friday morning? As a non-profit, volunteers are one of the most important resources we have at the Zoo, contributing more than 40,000 service hours every year. Today was the first time we hosted multiple large groups at a time. Having teams work together allowed us to complete many much-needed projects in a single day. Our volunteers knocked it out of the park this morning, making us certain we’ll deem Corporate Workday a reoccurring event. “The ability to work willingly together for the betterment of our Zoo is unmatched. The time our volunteers donate is very important to both the Zoo and the folks involved, making it a true win-win situation,” said Bates. Learn more about volunteering with us at dallaszoo.com.